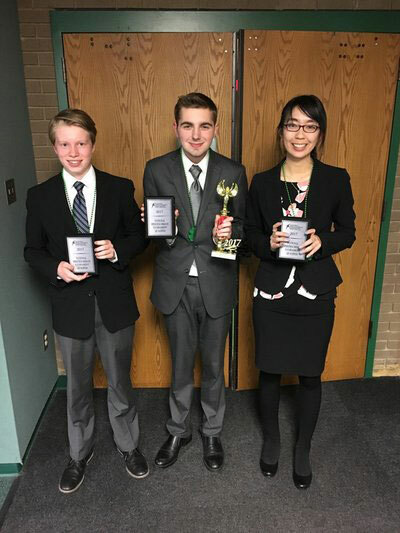 Speech and Debate has a history of performing well at competitions such as districts and state and this year is no exception. Their hard work and dedication have lead them to the National Speech and Debate Association’s national tournament. Two weeks into summer, RBHS will send four students to the tournament. This is more than the school has ever sent. June 12 marks the beginning of the five-day long tournament. Seniors Chase Ford and Becca Wells, junior Sonya Hu and freshmen Will Cover compete in four different events. Ford will be doing the Lincoln-Douglas debate, which is a one-on-one debate; Hu will be doing International Extemporaneous Speaking. Cover will be doing US Extemporaneous Speaking, and Wells is in the World Schools event with two other individuals from other schools in Missouri. Ford has been in debate for four years now at RBHS and has loved the community and family bond that has been built in debate. Ford is incredibly humbled to be able to represent RBHS at the big of an event.